A native of Iran, Ariyo Shahry began his musical studies on the French horn with Javid Madjlessi, former principal of the Tehran Symphony Orchestra. He received the Fajr Music Festival Award and a music diploma upon completion of his studies at the Tehran Music Conservatory in 2002. Mr. Shahry then joined the Tehran Symphony, Tehran Philharmonic, and Tehran Youth Symphonic Orchestras. Continuing his education in the United States, he began his study of composition with Keith Kramer and Benny Russell at Harford Community College (HCC). Mr. Shahry was elected to the Phi Theta Kappa International Honor Society and received an Associate degree of Performing Arts during his studies at HCC. As an active composer and arranger, Mr. Shahry explores the connections of the past, present, and future, specifically with inspiration from the natural world, poetry, and visual art. He incorporates music with a vast spectrum of acoustic and electronic musical styles into a variety of settings. 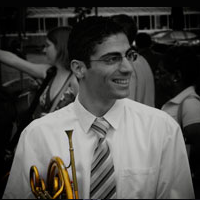 As member of the Baltimore Composers Forum, he works with many of the area?s finest musicians including Joseph Satava, The Capitol Hill Chamber Players, and the harp and saxophone duo “Pictures on Silence.” Mr. Shahry is currently pursuing a Bachelor of Music degree at The Peabody Conservatory of the Johns Hopkins University where he studies composition with Michael Hersch and French horn with Philip Munds. He is the recipient of the Louis Cheslock Memorial Scholarship, the Randolph S. Rothschild Scholarship, and the Eugene Scheffres and Richard E. Hartt Scholarship.